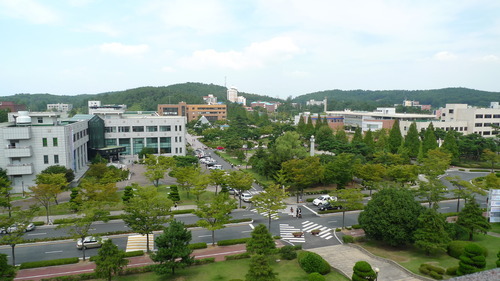 I finished my last day at Kunsan National University (Gunsan, South Korea) yesterday. For the past few days I have been going into the office to hear students complain about their grades and ask questions about why they got a C instead of an A. In total I had 3 students come in to see me. I had to go in for two hours a day, which isn’t that long but I got paid for the whole day. My experience at this university has been really good. I have learned how to teach adults in an effective way. I have actually learned how to use a lot of the techniques and practices that I learned in my TESOL Certificate course. I found myself enjoying some aspects of it, such as dealing with students who were patient and mature. I also hated other aspects of it, such as students being forced to learn it when they are really not that interested in it. I have learned a lot from my co-worker, Brett, about how to teach adults in an interesting way. I learned a lot from him about other things as well but that is a separate post all together. I also have learned a lot from my boss Adnan. I was always a bit uncomfortable with him since he is such a perfectionist while I am more of a big picture kind of guy. He is more interested in the rules and regulations while I am more interested in making sure the students are enjoying the class. He is a great teacher, but I always felt a bit uncomfortable around him. In the end he gave a huge complement by remarking on how much I have improved over the period of time here. He also let me know that he was willing to write a letter of recommendation, something he rarely does. Coming to Gunsan, helped me a lot to become a better teacher and I will always be grateful for the experience. Previous Post Happy Pride Toronto!